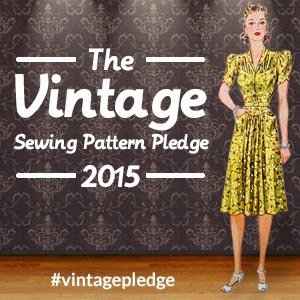 Today I signed up to the 2015 Vintage Sewing Pattern Pledge. 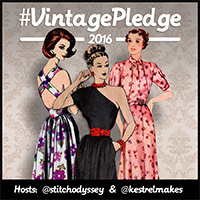 I kept my pledge simple, as I am new to sewing with vintage patterns. 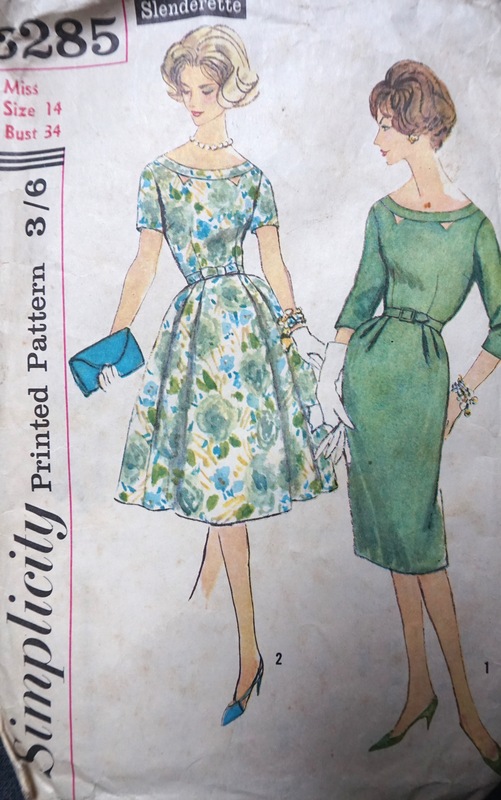 I have pledged to use my first vintage sewing pattern in 2015. I was looking through my stash and just couldn’t resist it. Its not my usual style and looks complicated, but I love the cut out detail in the neck and I think it could look really awesome in the right fabric. I’m putting this choice down to my obsession with Mad Men and possibly the fact that I just finished reading Breakfast at Tiffany’s. View 1 (Right) reminds me of something Joan Holloway would wear in Mad men, while View 2 (Left) is more Betty Draper. I think I will go for the Joan. Not entirely sure which fabric to use at the moment, the pattern suggests a variety of fabric types from silk to linen, satin, wool or even jersey. I think I will make a toile first as I am guessing the vintage proportions may not favour my height. This project will no doubt be a long one, so I will keep you posted. It is a glorious weekend. 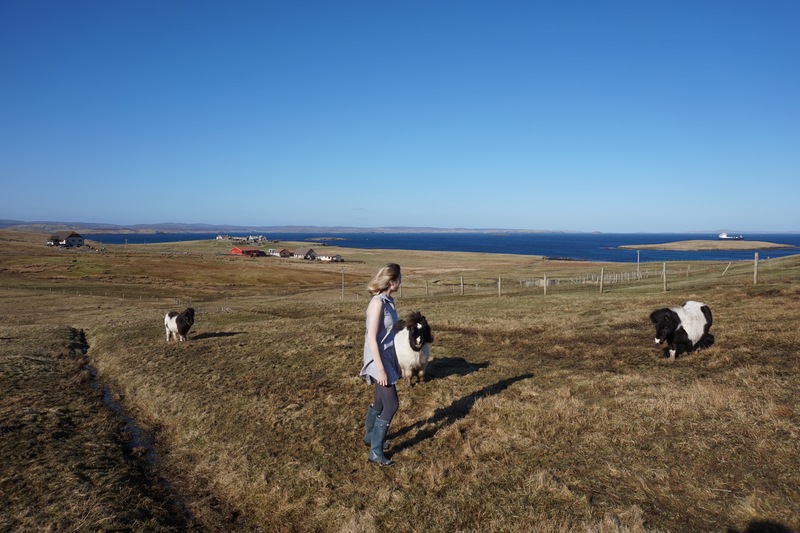 The sun has come out after a spell of horrible weather and it finally feels like spring is coming. 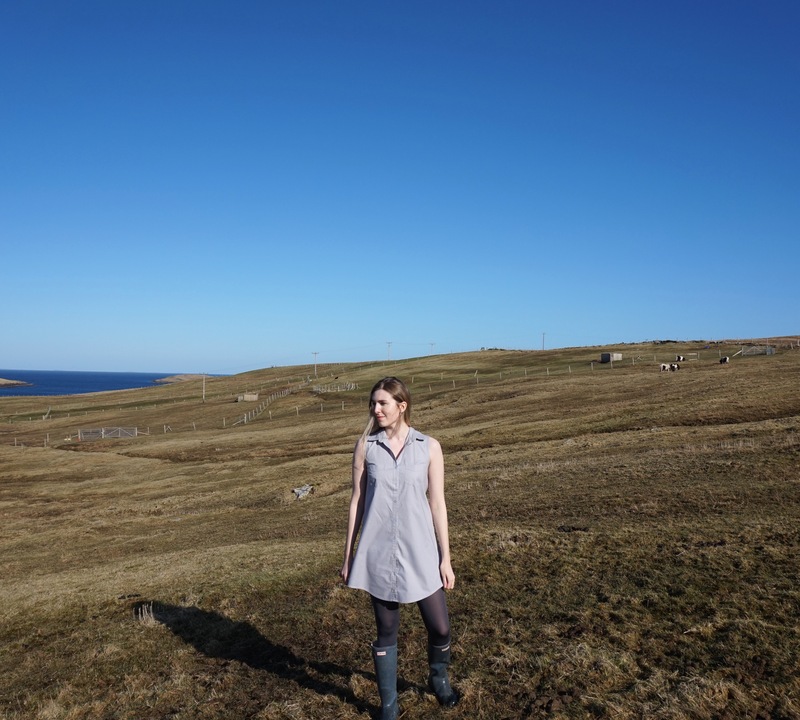 Here is my finished Alder shirt dress by Grainline Studio. I made view A using fabric from Backstitch, Klona cotton in Ash. I originally increased the length of the dress by 2 inches, but I managed to get all the way to hemming before realising I had forgotten to adjust the length of the button band to fit with my alteration. As it was all sewn in and the collar was already attached I couldn’t adjust it and had to cut the additional 2 inches off the dress length….woops. Thankfully, I think the length turned out fine. Other than that the project went rather smoothly, with the help of the excellent Alder sew along. The only bit I struggled with was enclosing the end of the collar stand. I just couldn’t get my head around it at first, but after a lot of messing around and re-reading of the instructions, it finally clicked. 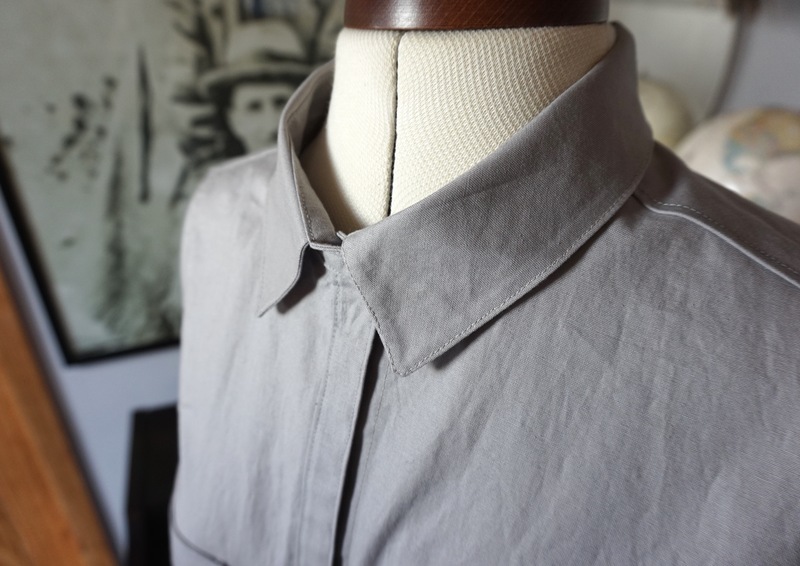 This was my first shirt type garment, so I learnt a lot from this project. I found it really enjoyable to sew, turns out I really enjoy topstitching. In hindsight, the fabric choice maybe wasn’t quite right for this garment. It is a bit stiff for this style, it creases easily and doesn’t have much of a drape. I don’t think it helped that I went one size up for a more relaxed feel, possibly if it was more fitted, the fabric would have been fine. Next time I will try this dress in a cotton lawn or maybe even silk if I’m feeling adventurous. With winter dragging on, I was desperate for a new warm winter hat, but didn’t fancy knitting one. I wanted an instant result, so I thought I would try making one from an old wool dress I had been planning to recycle. I sketched out a basic hat shape on dot and cross tracing paper for a pattern and added a 1cm seam allowance. 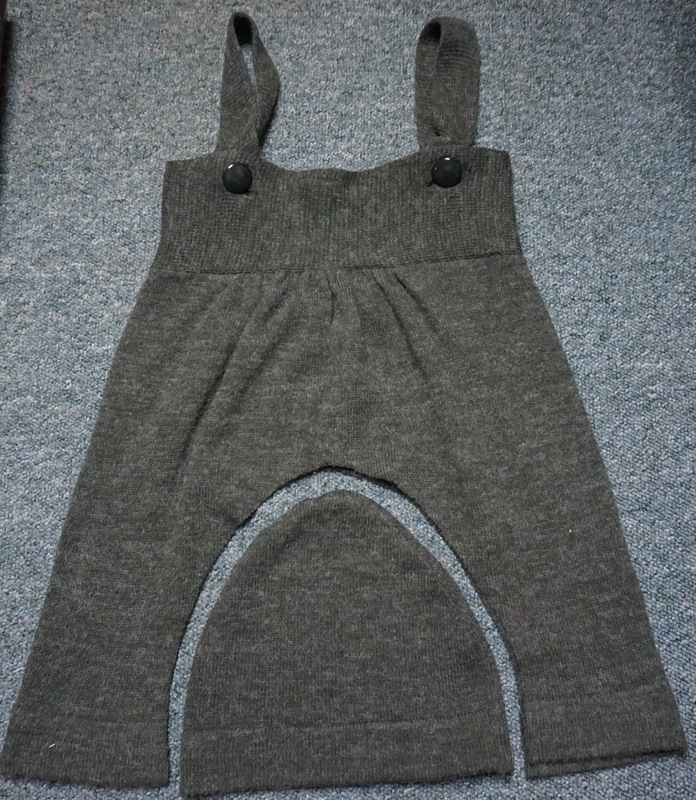 Placing it on the bottom of the wool dress, double thickness, I cut both pieces in one go. The hat was assembled by stitching around the curved edge, right sides together. It really was as simple as that. I ironed the seams flat, as best I could, with a cotton cloth between the fabric and the iron et voila. Using the already finished edge of the dress as the base of the hat made it so easy, no need to add a band or finish the edge. I made it very oversized as I prefer my hats floppy. I am very happy with this result. 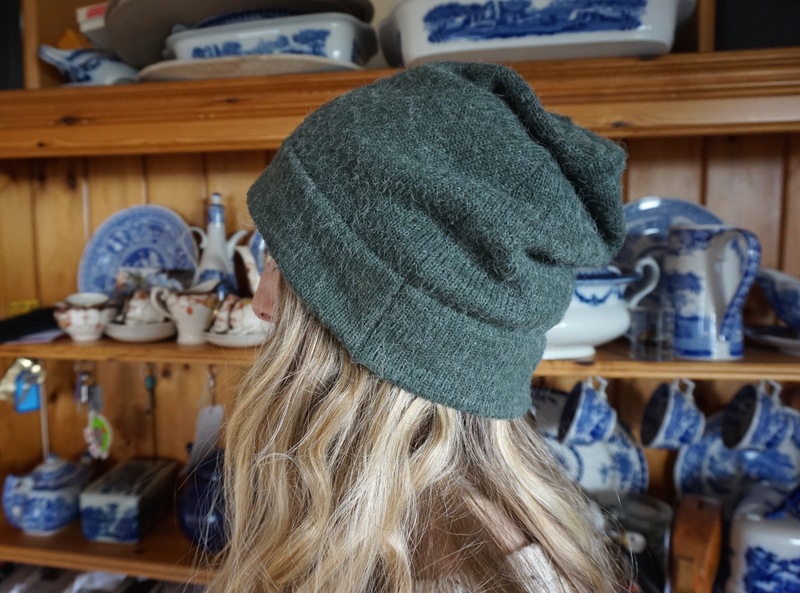 It looks a bit like a tea cosy….but I love that. One thing I could have done to improve this make, would have been to felt the wool first to prevent unravelling. I didn’t here as the wool content of this fabric was low, so I didn’t think it would work. 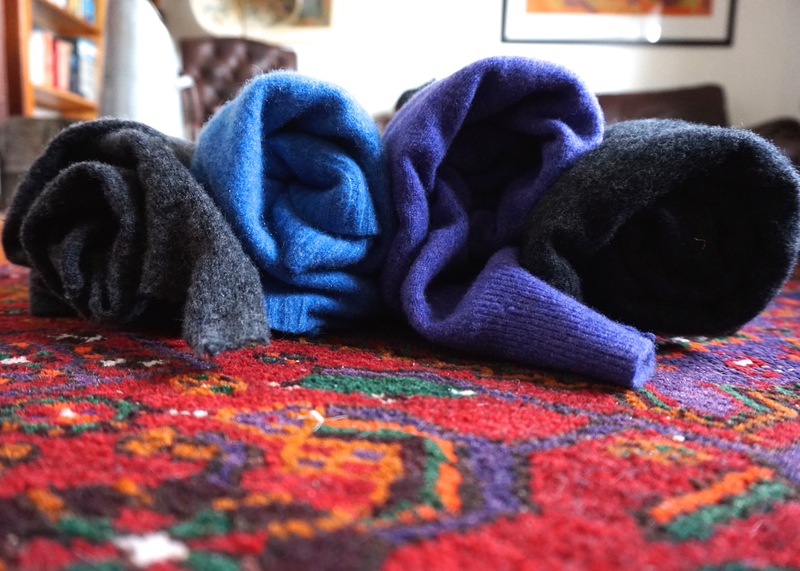 However, I recently acquired a pile of old 100% wool jumpers to recycle, so I intend to felt them and try again. 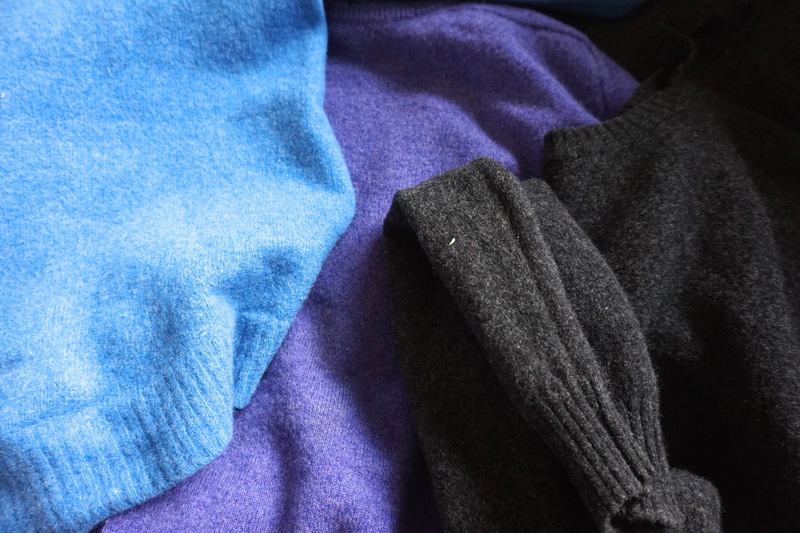 Check out my felted jumper stash below, should get a few hats out of that lot. 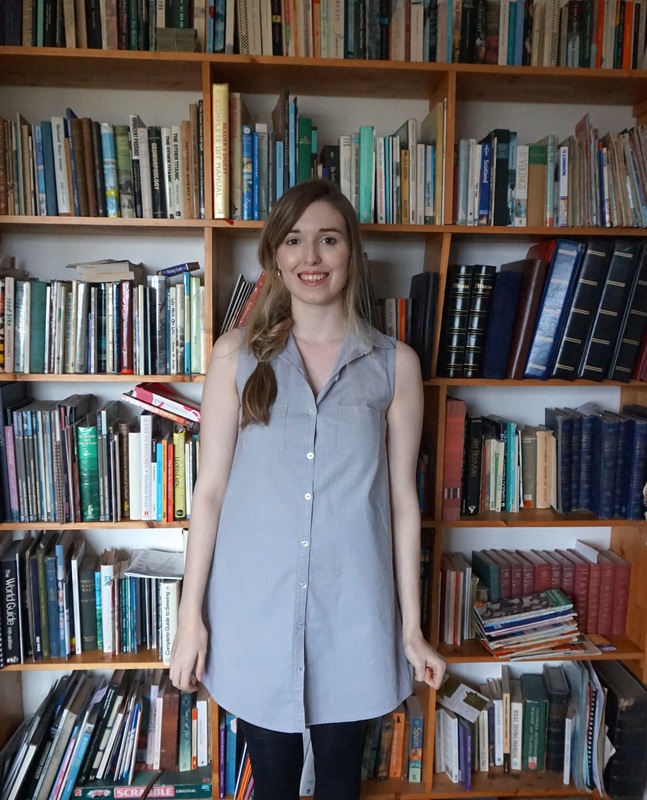 I was originally planning to share my latest make with you today, a Grainline Alder Shirt Dress, but unfortunately ran out of thread before I could finish the button holes. Living on an island doesn’t lend itself to last minute haberdashery shopping, so unfortunately I only have a sneak peak of the nearly finished product for you. Happy Sunday. 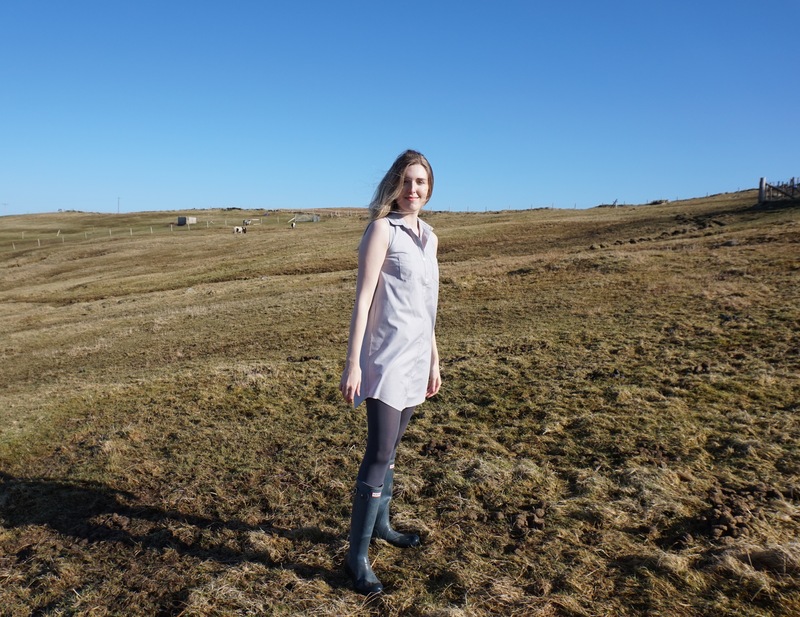 The Coco dress by Tilly and the Buttons is another of my favourite Indie patterns. I have made two, so far, and have a third in the pipeline. It is a great wardrobe staple and is stylish and warm, which is an ideal combination. This was my first make with knit fabric, but it was nowhere near as tricky as I expected. It has inspired me to make more garments with jersey, so watch this space. 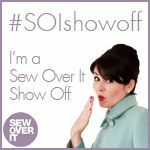 The version I will be showing you today is made from a lovely, soft, polka dot Ponte Roma jersey from Backstitch.I made minimal alterations to the pattern, adding 2 inches to the sleeve length and omitting the pockets. 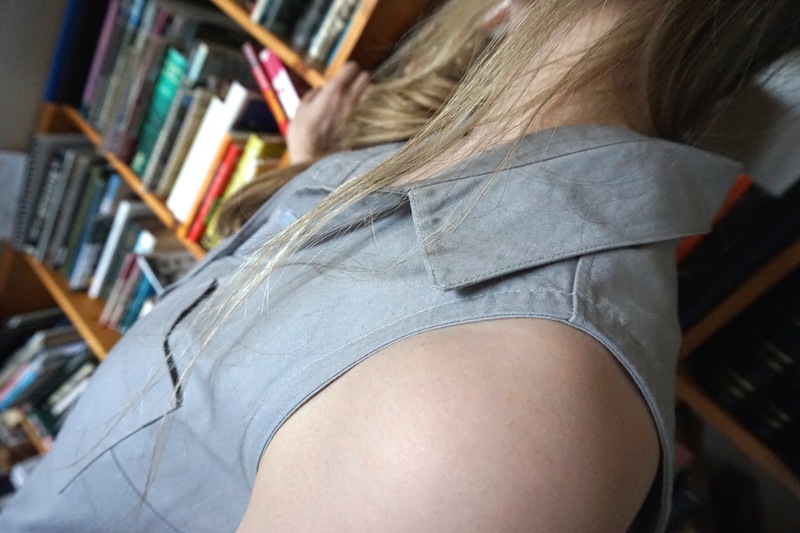 I normally love adding pockets, but I felt this dress would look more formal without them, and I wanted the option to wear it during the day or on nights out. I made this last summer and I wear it often, so it is holding up well. 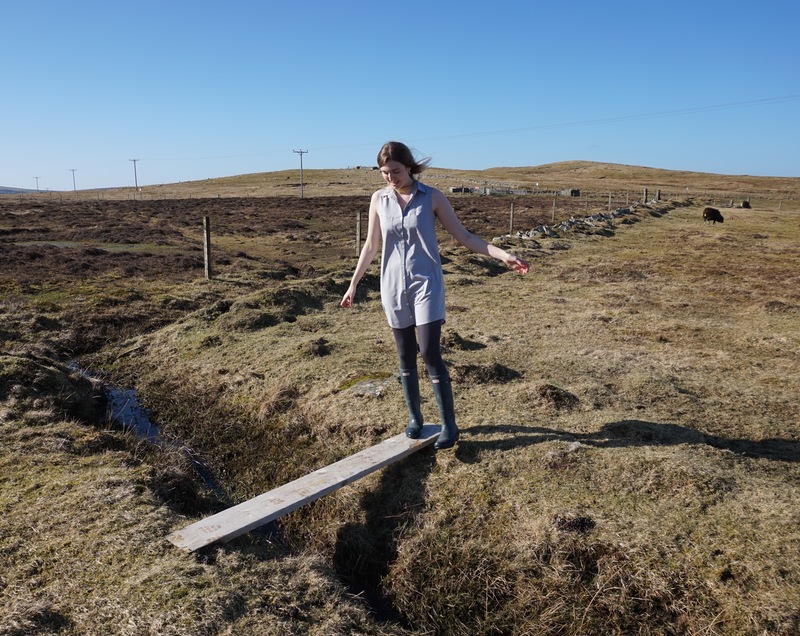 I was planning to photograph the second version today too, but as you are about to see from the photos, the weather in Shetland this weekend made the photo taking a challenge. It was very wet and windy, so my hair is out of control in the pictures. I was going to give up and wait for a calmer day, but I find the photos kind of funny. I left one in at the end, which makes me look like cousin It, for your amusement.